I hope you will read the short article below, written by Councillor Angela Trend, which gives a local flavour to one of the reasons why we look back to the 1918-18 World War and to the various activities that will go on throughout the country in November this year to commemorate the end of this awful time in our history. Lyndhurst was packed. Not with tourists like today but soldiers preparing for war. Every hotel and guest house room, every spare room in homes was taken to billet the men. Around Lyndhurst all green spaces, forest land and fields were crammed with tents. Stables, sheds and outhouses were stables for the horses. 15,000 men, most between 18 and 21, lined up to march the 12 miles from the Bench to Southampton docks. There were still men waiting to leave Lyndhurst while the first soldiers were embarking for France, the Somme, the Front. One week later only 2,300 of these 15,000 men, known as ‘the Immortal Seventh Division’ were still alive. Many more were badly injured. These young men had spent their last night here in Lyndhurst. They were all someone’s son, father, brother, husband, uncle, cousin, workmate, neighbour or school friend. Our local heroes are remembered at public memorials at the Bench and the Emery Down Lych Gate. November 11, 2018 commemorates the end of this, The First World War. Below is a photograph we would like to purchase. It is made by David Ogilvie and their website is www.david.ogilvie.com This seat is the Armed Forces memorial seat. Quite a few of you in the local community have volunteered to donate towards the seat but it costs £1000 including delivery so we are having one last “big push” to see if we can raise some more money and give Lyndhurst something to remember all those who gave their lives for us. Any amount will be gratefully received. Contact details are shown below so please get in touch. Oh yes, and most importantly, we hope to be able to position the seat near the Fire Station, on ground that overlooks our War Memorial. Judging will soon be taking place for the photographic competition and the winning entries will have pride of place in our 2019 calendar, showing our villages, hamlets and surrounding forest off at their best. More of both these items to follow in future Clerk’s Corners and if you would like to advertise in the calendar please get in touch with Councillor Chris Willsher or myself. 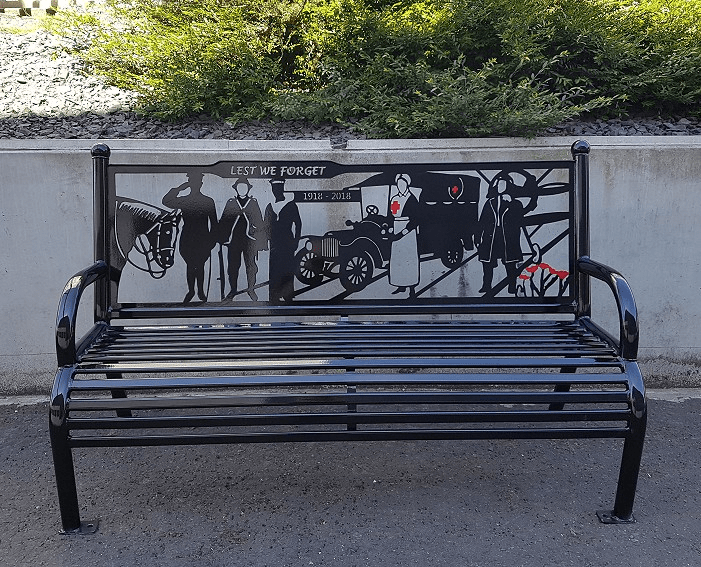 Going back to the subject of public seating, I have been asked to write about the plaques that seem to have appeared on some of our public seating. Increasingly, we find that dedicated seats have had “unofficial” memorial plaques added to them. There are a number of seats around the village that are dedicated to past residents. These have been paid for by their loved ones in their memory and have plaques on them, but we have also had plaques added to seats, some of them existing memorial seats, with unauthorised dedications in memory of people and pets. This can be upsetting for those who originally dedicated the seats and I have to inform people that any such plaques will be removed by the Parish Council. Would anyone like an allotment? At this time of the year we renew tenancies and it is fairly standard practice that a few allotments come back to us each year for various reasons. So, if you are thinking of taking up allotmenteering, either as a hobby or as a start to becoming self sufficient, now is the time to get in touch. At their September meeting our Councillors considered applications for grant aid funding (Section 137 of the Local Government Act 1972). There was £1,500 in our budget this year and after careful consideration £1,000 was awarded to First Responders for a defibrillator and £500 to the Lyndhurst Lights and Decorating Committee for the Christmas lights – both very worthy organisations. Our next Parish Council meeting will be on Tuesday 9 October 2018 at 7.15 pm in Lyndhurst Community Centre. Why not come along and see what your Parish Council can do for you. Margaret Weston, Clerk and Responsible Financial Officer, Lyndhurst Parish Council, 13 High Street, Lyndhurst SO43 7HJ (email: clerk@lyndhurstparishcouncil.org.uk /tel: 023 8028 4928 or 023 8081 3218). The office is usually open to the public from 10.30 am until 1.00 pm on Tuesday and Friday mornings and by appointment at other times. When paying a visit to the office it is often advisable to telephone first as, with only one member of staff who is sometimes out on site, there are occasions when it will not be open at the above times and we ask for our residents’ understanding as this is unavoidable. Why not come along to our Council and Planning meetings. There is an opportunity for members of the public to air their views at the commencement of the meeting.